By request, a few ideas about layering necklaces. To simplify, a one third to two-thirds ratio looks pleasing. The bigger, heavier chain is A in the diagram at left, the finer one is B. or, layer all necklaces at slightly differing lengths. This Anthropologie Treasures Unearthed necklace shows how the ratio applies between the smallest and longest strand. If there's too much space between the first and third necklace, the layers look a bit "lost" and droopy. 2. Match metal colour: gold (or gold-tone) with gold, etc. Have fun mixing faux and real, but don't mix silver with gold unless it's already part of one necklace. 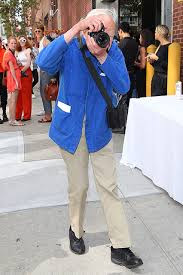 This is one of those odd aesthetic rules, in the same vein as 'black shoes look good with navy pants, but navy shoes don't work with black pants'. It just looks like you don't have what you need. Multiple necklaces are a busy look, so if you like to wear prints or bold colour blocks, one necklace is enough unless you want a gypsy or eccentric look. What mood would you like? Wooden beads mixed with a gold chain create a casual, boho vibe; the same gold chain layered with pearls is classic. 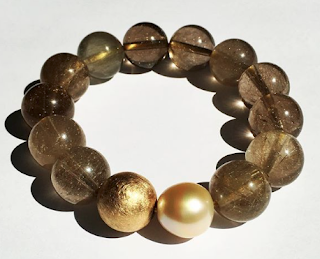 Mixing strands of beads, say a strand of turquoise with a strand of deep amethyst, or a tiger-eye strand and a citrine strand, is a refined, elegant look. Mix pieces of substance with airier ones; too many thick necklaces will kill the charm. Play with mixing beads with other beads, chains of varying weight, or an assortment of chains and pendants. Start with a two-layer composition. Aim for some sort of harmony, so you don't look like a kid throwing on the contents of your mother's jewelry box. I like pieces with some heft, though you do have to watch out for too much weight on your neck. Assembling many bitsy chains and pendants looks jeune fille no matter how many you layer on. 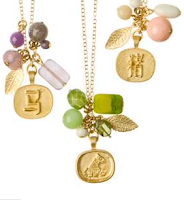 These Year of the Necklace pieces from Anthropologie are about $50 each. They showcase animals from the Chinese zodiac; I'd like the jade, sandstone and glass Monkey. You might mix the pendant with pearls. The double keshis shown above, from Kojima Pearl, $65, would work well. A colour reference among the layers ties disparate pieces together; shown left, coral beads with a bead and chain pendant. If you're buying for layering, you probably already have some necklaces, so search for the focal piece that ties everything together. 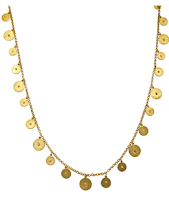 I'd pick this Ben Amun lentil necklace, at 48", it provides a very long, swingy bottom layer, or you can double it for two mid-length layers. The lentil drops are varying sizes, for grace and movement. Gold-plate; $195 from Max and Chloe. In silver, I would love the Hermes Chain D'Ancre, which at $1,225 is worth every penny; will not date and if I am wrong, you could sell it to me (installment plan, please). I do not long for much, but there's this. 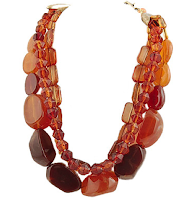 I'd wear it with substantial beads like this Jay King 19" carnelian bead necklace, a mere $70 from HSN, available to the USA. The best buy is a piece that has enough character to be worn on its own. That's why I like this Saundra Messinger 29" silver circle necklace with .25" and .5" discs, $470 from Fragments. Photo is a little washed out, and doesn't do it justice, but it's really pretty, fine without being dainty. 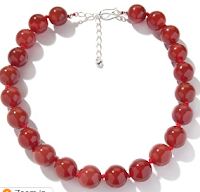 I might layer it with Avindy's circle-linked necklace, echoing the spheres, but adding colour with rhodolite and topaz, $390, from Fragments. 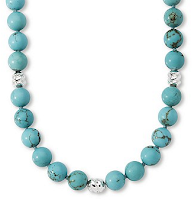 To get an entirely different look with the same silver chain: layer with a 20" turquoise and silver-ball necklace, $116 from Ross Simons. I like layering that's fairly classic and grown-up; the Olsen twin messy nests are not on display here, you can find them in any mall. 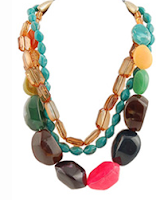 Portia Jewelry show a Tropic Bead necklace with three layers of beads; the exuberant mix seems like a steal for $39, with the longest layer at 19". Portia also sell a brown layered bead necklace, (longest layer 18"), for the same price. Fun mix if you can wear your pieces this short. Think about where you want the eye to rest. The smaller-busted you are, the lower you can go, if you have a high bust line; see Madonna in the Givenchy necklace that has been knocked off by everybody. If you have more bust, wear one 16-inch and one 18-inch necklace, or go a bit longer, but stop short of the pieces dangling in the air like climber's ropes over the Matterhorn. Cynthia Nixon's necklace shows how the opera-length (at longest) to choker (highest) layers raise the eye. 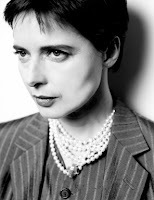 And on Isabella Rossellini, short layers, which look chicest to me, and flatter your neck, especially with short or upswept hair. Keep the earrings simple; I do like big rings anytime, though. I have to admit to never layering necklaces, but I think each of my pieces is too much a hero not to fight with any other piece at the same time. As always, Duchesse, you've presented some gorgeous and tempting options. The 'chain d'ancre' is on my "when I win the Lotto" list. I've been experimenting with layering this past year. I've found that the more different the look of the necklaces, the more pleasing I find the result. But I also enjoy a Chanel-esque pearls-and-gold mix for dressy occasions. Thanks very much for this, Duchesse -- I've been wanting to try this look but have always lost my nerve before taking it out of the house. With your guidance I might push myself a bit more -- I've already got some ideas about a chalcedony necklace that's not getting worn enough . . .
Isabella Rossallini looks lovely in the short multi strand pearls...but Madonna looks silly is the multi strand chain. I usually don't layer unless it is a long "diamonds by the yard" or "gemstones by the yard" look. Those types of necklaces have just the right delicacy to layer and not overwhelm your look. My summer look is a 90 inch multi "gemstone by the yard" style necklace in 18K yellow gold wrapped 4 times around my neck. I love the colors. Layering necklaces is new to me. Maybe I want to keep things simple. Actually I nowadays have so little jewelry, that it would be even impossible. I just want to wear 1-3 things at a time. But the necklaces you have chosen are nice. 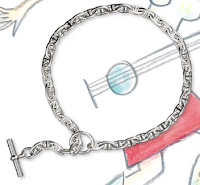 I especially like the long, silver circle chain- if only it were in white gold, my favorite! I love the ideas you've shown for layering, but rarely manage it myself. I think that part of this is that most of the necklaces I am attracted to are such statement pieces in and of themselves that they don't play nicely with others. I have started looking at pieces that might work as an ensemble though. Imogen: Yes, it takes some finer pieces to cozy up to bigger you already have. Resale stores are often troves of inexpensive layering pieces. Belle: You have one of my dream necklaces, certain to be gorgeous on you! Where did you find it? Am so envious I can hardly type. 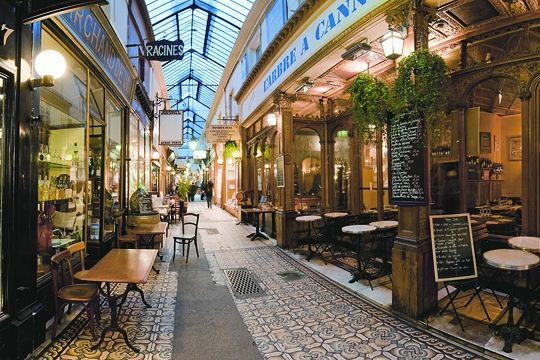 Pseu: How about a time-share on the chain d' ancre :) ? metscan: This post was work for me as I'm a put one on and go type, but wanted to play with them. Turns out I have a couple of chains/necklaces that look good and not overwhelming. materfamilias: Welcome! When you test drive I will look fwd to seeing your big smile above your combos. 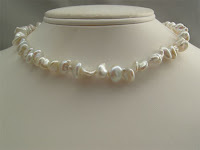 mardel: That was my style too, until saw my gf friend with pearls layered with a pendant; then I began to want to try it. It's a fun alterantive. Thank you so much for this! Today I am wearing three necklaces for the first time in my life, and I'm happy to report that I sort of instinctively followed some of your guidelines. I've been experimenting with more subversive jewelry (as in pieces that don't "match") with very simple clothes this summer, so your ideas are most welcome. p.s. I agree with you about doing what you "like" and hopefully making money. It's not a black or white situation. Oh-la, ma Duchesse! I love the way you mix wonderful practical advice with tasteful suggestions - price, provenance and all - in your posts. Gosh, I'm glad you're home! I really enjoy your jewellery posts - I still haven't got out there to buy myself any, but I will be re-reading your great advice and checking your pics again before I do! sallymandy: As one of our clever thrifters, I predict you will find some steals for layering. s. & tiffany: Thank you kindly! I'm out today prowling for a necklace, with a tiny budget and high hopes. Thanks for all your "leg work" (finger work?) on this topic. I love the look of the layered necklaces, but alas, I'm too timid to go beyond the single strand of pearls. Although...I just may give it a whirl after reading your post. Duchesse, the multi gemstone necklaces in three lenghts, 21", 30" and 90" are on Beladora.com. They are custom made for Beladora. Thank you so much for providing such great ideas and tips. I love to wear pearl necklaces a lot. Just got a new one from Stauer.